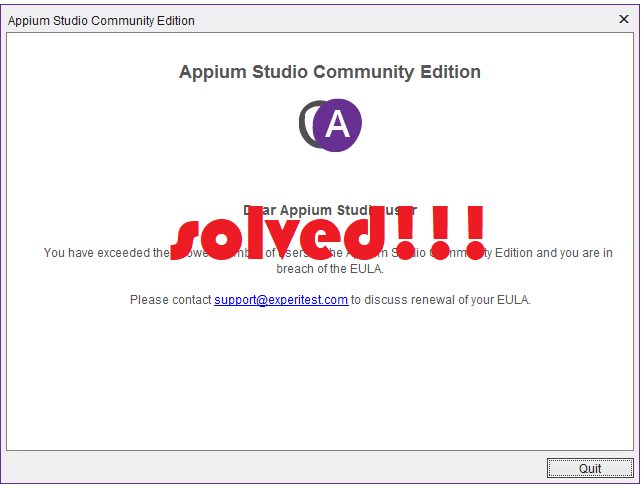 Hi, In this post, I will tell you how to solve the most common error ""You have exceeded the allowed number of users of the Appium Studio Community Edition and you are in breach of the EULA" without waiting or mailing them at the client side. Run this BAT FILE as administrator. reinstall appium studio and ola!! you are done. Now you can play Ninja Saga on your Android device!! It's one of the MOST POPULAR and BEST Ninja-themed RPG with 18 millions of fans around the world. Since its online debut in 2009, this top reviewed social RPG on Facebook with its dazzling manga graphics and sensational gameplay had been enticing the hidden Ninjas in the hearts of over 70 million players worldwide. May be you wanna bleach your hair like Naruto and no matter you wanna be Samurai, Pirate or other Anime character!! Just simply create your own Ninja Avatar and fully customize with a vast selection of Ninjutsu, outfits, gears, weapons, and pets in order to bring peace to the world! To explore the ninja world and experience the exciting adventure with completing your daily missions, level up, learn the ultimate Jutsu, and discover the Bloodline skills to progress and become stronger! Someday you will be the number one in this piece of land. - Customize your own Ninja Avatar with weapons, outfits and even Ninjutsu! - Tons of daily missions that keep you busy for hours!